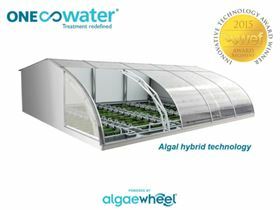 Algaewheel is a small-scale wastewater treatment and water reuse process. According to OneWater, Algaewheel is a proprietary technology for small-scale wastewater treatment and water reuse. The company says that it is a modular system that can be installed quickly and mimics nature’s biological process to deliver high performance. It is a low energy, self-sustaining ecosystem which uses daylight, algae and bacteria to autonomously deliver treatment without the need for dedicated skilled staff and complex process control. Algaewheel is claimed to solve the problems of current small-scale treatment, which enables communities and businesses to move away from centralized, big-pipe infrastructure to decentralized independent treatment and reuse. Algaewheel is also said to be a solution for the replacement of aging or failing biological systems, as it can be quickly installed as a retrofit without treatment disruption.